An ICF home construction in Northport, Long Island, NY that we designed. 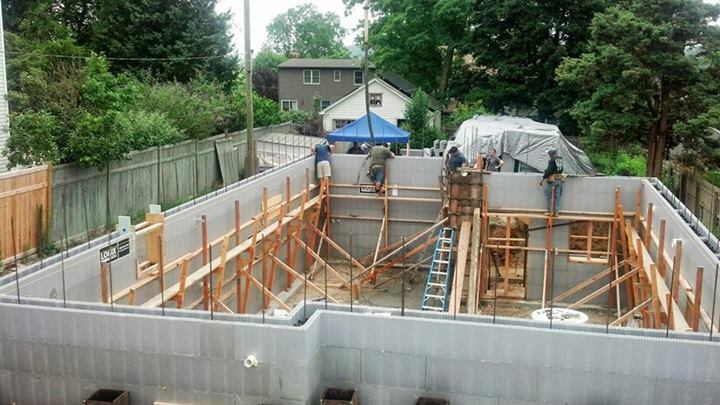 In this photo, the insulated concrete forms are up and the contractors are ready to pour the concrete. The best option for new green home design and commercial green buildings is insulated concrete forms (ICF). An ICF is a sandwich of expanded polystyrene foam on both sides which create the forms for the concrete. Then the concrete is poured into the forms. The foam form stays in place and acts as the insulation for the building. How Do Insulated Concrete Forms Work? Traditionally, when pouring concrete into removable forms, the contractor wants to remove the forms as soon as possible and bring them to the next project, allowing some of the water to escape before engaging with the cement. This prevents the concrete from reaching its potential strength. With ICF, the forms stay in place, keeping the water in the concrete. A common misconception is that concrete dries. Concrete does not, or should not dry out. Concrete cures, the water stays (or should stay) to chemically merge with the cement. ICFs will retain all the water in the mix. Studies have shown that concrete poured into ICFs far exceeds the original predicted strength. Owners of ICF homes will experience less temperature swings inside their home than traditionally built homes. One of the biggest advantages of ICFs is thermal mass. Thermal mass is a material’s capability to absorb, store, and release heat energy. Intuitively, we know that if we heat a concrete block and a block of balsa wood to the same temperature, the concrete will absorb more heat energy and cool more slowly. A concrete house modulates the indoor temperature by absorbing, storing, and slowly releasing heat energy that can buffer changes in outdoor temperatures. In nature, you can see this in caves. The temperature in a cave is steady and unaffected by the changes in weather because of a huge thermal mass, the crust of the earth. ICF houses are coupled to the steady temperature of the earth. Owners of ICF homes will experience less temperature swings inside their home than traditionally built homes. Air infiltration is the greatest factor in keeping a building cool in summer and warm in winter. We can have a building with the highest insulation value we can find, but if it leaks air, the insulation is rendered useless. If a person sleeps on a cold night with a thick comforter on them and we place a soda straw under the covers and blow in cold air, the thick warm comforter does not matter. ICFs are a monolithic pour of concrete and there are no seams for air to penetrate. An ICF home is a fire proof bunker. As we all know, concrete is impervious to water and so is the expanded polystyrene forms. If an ICF house is ever flooded, the shell sustains no damage, extremely important on Long Island, where flooding from Hurricane Sandy destroyed so many homes. Concrete is also impervious to fire. When the forms are protected by gypsum board (sheetrock), an ICF home is a fire proof bunker. In resisting high winds there is nothing that compares to reinforced concrete. An insulated concrete form building is one that is built to last. Durability is one of the keys to a green building. If a building’s lifespan is short, the materials that go into it are cycled too quickly and making proper use of our building materials is important to efficiency.